And they’re right. It’s so critical to leverage your professional network when looking for a new position. But what do you do if you’re finding your current network marginally helpful at best? Surely, you could consider branching out to new people (and you should always—throughout your entire career—look for ways to continue building strong ties with people who may be influential to your professional life), but what about now? What can you do now—with your existing network—if you feel like you’re getting nowhere fast? It’s astounding to me how many people just assume that their people understand with any clarity what it is they do, and how (specifically) they may be able to help out. When you call or email your contacts and ask them to “keep an ear out” for opportunities, they may be more than willing to do just that—but confused about what, exactly, you do for a living. A networking letter is a simple note that you send to your closest people, outlining that you’re actively searching and sharing what specific types of roles would be great for you and what skills you’d like to put to use. If you paint a picture of the company or job at which you’d be the best fit, your people will have a much easier time considering how they might be of specific assistance. Assuming Sarah knows Jerry pretty well, you could be chatting with someone on the inside of a company of interest within less than a day. Not bad for someone who thought you had no “in,” right? 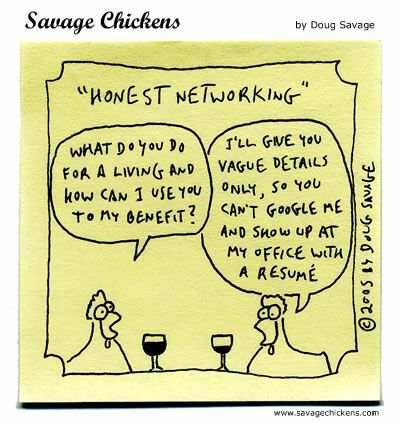 Something that bugs people about networking is that it feels very ambush-y. “Give me this!” “Help me with that!” “Could you walk my resume over to your manager, stat? !” If this is how you’re going about networking, it’s no wonder that your people aren’t being helpful. Consider instead a strategy that asks your contact for something small (say, “May I ask you two quick questions about your experience at XYZ Company?”) before you ask for a larger favor. Build rapport. Be genuine and interested. And most definitely, when you say thank you, ask if there is anything that you may do to help that person out. Reciprocity is a magnificent thing. Look into it. We’ve all pretty much bum-rushed LinkedIn for career networking, and that’s not at all a bad thing. LinkedIn is, far and away, our best online resource for job search and professional networking. However, Facebook can also be supremely helpful to your cause. Think about it: Your Facebook network probably consists of your closest friends. In theory, these are the people most likely to “have your back” when you need something, like a new job. But if you never alert them that you’re looking, how can they possibly be of service? They cannot be. Use your Facebook status update—selectively—to alert your people of what you’re doing and what you need. On your way to an interview? Let ’em know. Looking for a contact at a company of interest? Ask. You definitely want to avoid being a big, giant downer (“Stilllll no job, people”), but using Facebook strategically for networking can be a very good thing. Certainly, if your network isn’t being particularly helpful, you may want to also think about ways to expand your professional connections, stat. But more often than not, there are so many ways you can better utilize your existing people. Try these first. You are currently browsing the Norwood Consulting Group blog archives for March, 2015.